Xenomedia provides professional marketing solutions for every level of business with a commitment to our clients success. We tailor our solutions to suit each client based on their individual needs. We understand that first impressions are crucial to the success of any business and that this professional image must be maintained through consistent branding. Your logo, stationery, web design and other marketing materials must portray your business in a manner that can be easily recognised across all media. We take the headache out of design by providing a complete design service with a personal, friendly approach. Our graphic design firm can design your corporate branding or corporate identity which includes logo design, business cards, letterheads, with compliment slips, presentation folders, stationery and whatever else is required for your corporate branding. To compliment our full design service, we give our clients the option of allowing us to take care of all your printing requirements. Archerfield Airport is Brisbane's secondary airport and Queensland's major centre for general aviation activities. 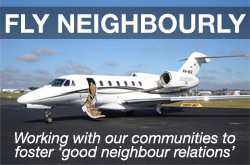 Located just 11kms from the Brisbane CBD and in close proximity to Stradbroke, Moreton and Fraser islands, Archerfield Airport has become a favourite destination for corporate aircraft, charter, flying training and all kinds of maintenance requirements.